Questions asked by beginners to sports betting are how to predict football matches accurately, sites that predict football matches correctly, best football prediction site in the world, or best football prediction site in the year. If you are one of such persons, then Ayokola.com.ng brings you good news. 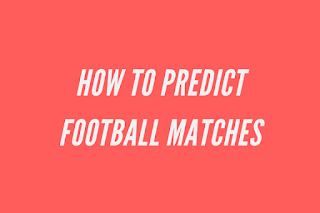 We have compiled a list of strategies to be employed in football predictions to make your football match predictions accurate. Grab a bottle of coke, sit tight and read on!!! The sports betting industry is one of most profitable investments that can be made with proper guidance. However, Predicting football matches accurately require time, deep research, and stats. The following strategies will increase your soccer prediction accuracy. There are leagues and teams that follow a certain trend all through the season. Information concerning a league is important if you want to make a correct football match prediction and make profits. Statistical data from sites like soccervista, statarea, and whoscored help forecast outcome of football matches, also show winning or losing streak of soccer teams. Step 3: Look at the league table to see data involving points, the number of matches played, latest results of matches, over/under 1.5, over/under 2.5, and over/under 3.5 goals. On the league statistics, click on any team to check for stats like matches played with results, upcoming matches, form, and winning and losing streaks. Note: Team statistics on soccer can also be viewed on flashscore, sofascore, statarea, and whoscored. Once these two stats are known, prediction of soccer matches can be done accurately. soccervista is my favorite because it has a robust archive of league and team statistics, covering livescores, betting tips, bookmakers list, etc. It is quite frankly on the list of sites that predict football matches correctly. Research into the team news is vital in predicting the outcome of football matches since you become aware of data such as English premier league suspensions list, weather report, injury lists in EPL, missing players list, and changes in team management. For example: Do you know that the entire Astra Guigui squad have not been paid for 3 months? Now, ask me how do I have such info. The answer is simply RESEARCH. Teams like this have a low motivation, hence complacency in the way they play football matches. Astra has declined in form due to this wage challenge. No amount of data can guarantee a 100% winning rate but it can help forecast football matches accurately like an 80% winning rate. You can also go to sofascore and click on any team see the suspension lists, injury lists, team streaks ( Home win, away win, over 1.5, over 2.5, and both team to score). Did I hear you say this isn’t important? Trust me, it is, I’m sure you would agree with me that certain teams in the English premier league, Spanish league, etc. Have a common trend they exhibit for over 7 seasons. Chill (- -) !!! For example, Real Sociedad and Barcelona: Barca have not won at Real Sociedad’s home for 7 league matches (not until 2018). Same goes for Newcastle and Chelsea, Chelsea hasn’t won at Newcastle for the last 8 matches. AVOID such match!!! My best football sites for head to head (H2H) stats are flashscore and sofascore, simply go to the team’s H2H sections and monitor their home and away strength. This gives you an accurate sense of the possible football match outcome. Pool bettors use H2H stats for predicting today’s football match prediction bankers (Draw). H2H record helps to predict a football match correctly by making you equipped with info regarding the trend of football teams. Goals per game or goals per match ratio tells you the average goals scored per game played. Let’s do a quick maths! Say we are given a team like Manchester City that scored 106 goals in 38 league matches. How do we calculate goals per match ratio? This is it – Divide 106 goals by 38 or use goals per game ratio calculator. We have 2.8 goals per match. I know we have questions like, how does it affect football matches? Keep on sipping your coke while I teach you! Goals per game ratio help you predict or forecast the number of goals that may likely be scored by a team. In the above example, Man City is capable of scoring over 2.5 goals per match (or 3 goals per match ) like we have rightly seen from their wonderful season. Imagine playing against that has goals conceded per game ratio of 3 goals per match, we should have “floodgate of goals” LOL!! These stats are is useful for predicting over 1.5 goals, over 2.5 goals, BTTS, home win and away win. It also teaches you how to predict soccer matches and win. A useful site for this is Over25tips. Here you can find data on the above, collated over the last five matches (both at home and away). It is similar to the goals per match ratio. It tells you the average number of points accumulated by a team per match played. PPG helps you predict soccer matches correctly by forecasting the number of points a team may likely acquire in a match. For example, Man city had 100 points in their 38 league matches (2.63 points per game), this means that man city wins almost every game they play (almost 3 points per game), thus making them achieve one of the longest winning streaks of an English football club. Look up footystats for PPG. Imagine knowing the expected points per game (PPG) of any football team before predicting a football match, how great a tool in your arsenal! These cover the form, financial struggles, relegation, and promotion battles between home and away teams in football matches. A football team on a good winning streak ( form) is most likely motivated to a win a match and vice versa. Of course, this doesn’t guarantee a 100% winning rate but it sure does gives us an edge in making correct football predictions. Whoscored provides this info. Can you remember 3 seasons ago in the EPL, Sunderland was in the relegation zone; due to this dilemma, they managed to escape the relegation battle for 2 seasons, winning all their last 4 matches including “beating” premier leagues giants like Chelsea, Liverpool, and Manchester United. This case defied all natural laws of football predictions (form, goals per game ratio, etc.). Do you know why? It is simply due to MOTIVATION. This is highly essential in predicting football matches correctly especially in the English premier league. Quick tip: Avoid these matches. Rather than looking for sites that predict football matches correctly, why don’t you take out your pen and paper and predict football matches yourself? The above tips do not explicitly guarantee a 100% winning rate on every football match predicted but it ensures your football match predictions are accurate. Sports betting is no easy task, that’s why you need deep research if you intend to beat the bookies. Do you want to win every single time you bet like a fixed match? No lies!! No fake ebooks!! I mean it every single time, Then CLICK HERE. Thank me later !! PLS SHARE THIS POST TO SUPPORT US!